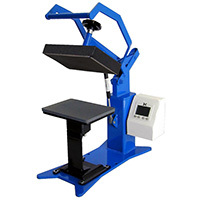 The DK8 label press is a 6x8 small platen heat press that is very popular for label printing, small transfers, and applique sealing. If your image area is less than 8 inches, and you need to specifically isolate an area of a garment or bag, the tall pedestal on the DK8 allows for precise location of just the area needed to be pressed. Pockets, collars, socks, sleeves and similar areas are easy to press without flattening parts of the garment that should not be pressed. This saves the user from pressing very large areas of bulky items unnecessarily, as would happen on a standard T-Shirt press. The 3 included interchangeable tables allow for isolation of the pressing area down to a mere 3x3 inches.